Since we have already seen a little bit of snow outside I have been looking for the perfect "be outside in it" must haves! 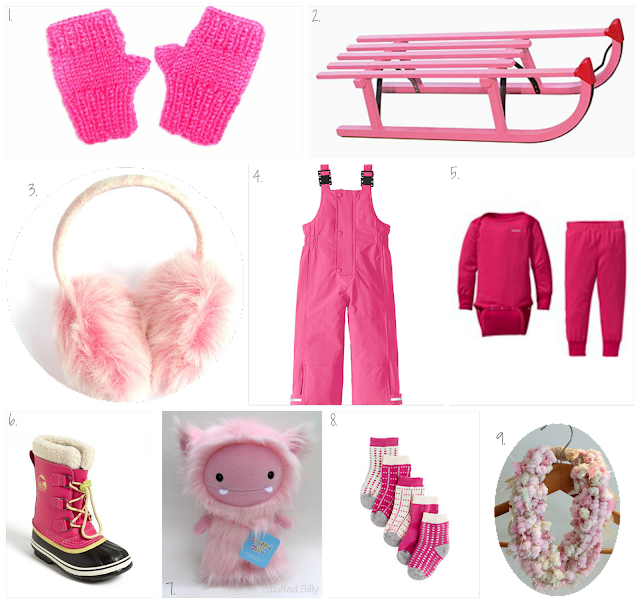 They all happen to be pink too which I love even more! I did not grow up in the snow and don't really have the first clue about it but all I know is that me and Adie girl need to be warm at all times! We can't stay inside all day when I have a girl like Adie so here are a few things we seriously must have to open the doors to have fun! I sure say it a lot but my Adie sure is the best! She so put up with me today! We didn't even get out of our jammies since I haven't been feeling too hot! She still laughs and giggles and plays and let's me get back to being Mommy! I have found so many fun things to do with her this month I cannot wait to show you guys!